NOTE: In Case You Missed Our 2018 Promo And News We've Added It To The Bottom Of This Updated Highlight Page. Make Sure You See It, It Has News You Won't Want To Miss! September 2017 Florida road trip, after Hurricane Irma. One week after the hurricane we traveled for a Post Hurricane Tiki Party. The party was at Witmer's Tiki Bar in Palm Bay, Florida (Butch's house). You all know any kind of tiki bar party and I'm there, but this was a special one. The party was with a bunch of friends of Barefoot Man, whose music you all know well from Tony's Tropical Tiki Bar; and those friends all got to party it up together with George, Chuck and Barrie (Barefoot Man and Band). Ten minutes before we left for the airport on SPIRIT AIRLINES' THEY CANCELED OUR FLIGHT! They used the excuse of air traffic, but the morons think we are dumb enough to just believe them. THERE WERE NO OTHER CANCELED FLIGHTS, OR EVEN DELAYS FOR OTHER AIRLINES for that matter. Basically came to find out they didn't have a lot of people booked for the flight so they decided rather than only make a few dollars just cancel the flight and screw the passengers who were booked. We found out they do that all the time. NEVER FLY SPIRIT AIRLINES IF YOU REALLY WANT TO GET SOMEWHERE!!! Now this was Thursday at 4pm. So what did we do? ROAD TRIP, we jumped in the car and went! 24 hours later we were in Melbourne Beach, Florida at our hotel, on our balcony for 5:00 cocktail hour; as you can see in the picture below. I put together a group of video highlights from the day of the party, enjoy. The 1st video has Tiki Tony making his professional singing debut, A MUST SEE. These videos should hook you in as to what a Barefoot Man concert is all about. Again, enjoy the videos! of Alice as performed by Barefoot Man and Band! MARCH 2017 Tiki Tony traveled to his island paradise, Abaco, Bahamas. Here I beat the so called blizzard of 2017 out of New Jersey by catching the next to last flight out of Newark. The airport was like a ghost town. Flew to West Palm, the only available flight to Florida, then drove to Ft. Lauderdale and was there for 4:00 am. Caught a noon flight to Abaco the next day and never thought twice about any blizzard. Less than 24 hours later I went from a so called blizzard, to this(the below video). That night, it was time to unwind, so we had a few drinks before dinner. Ferris, a good friend and local Abaconian brought us to his brothers place for dinner on the mainland. Now on the mainland there is a road running north to south for 80 miles, so there are cars on the mainland, unlike the outer cays which you can only travel by boat or golfcarts. Anyway, did you know that it is legal to drink and drive, or drink while you drive on the mainland? What a place. When we went to Abaco we stayed at Treasure Cay for 3 days, took the boat to Guana Cay where we stayed at Grabbers and took in the annual weekend Barefoot Man concert at Nippers beach bar, and from there we sailed on down to Elbow Cay where we stayed at Hopetown for 4 days to cap off the trip. The following videos will show what took place with the Nippers Barefoot Man concert making for a wild fun filled weekend. The below video was made by my friend Steve who we went on this trip with. 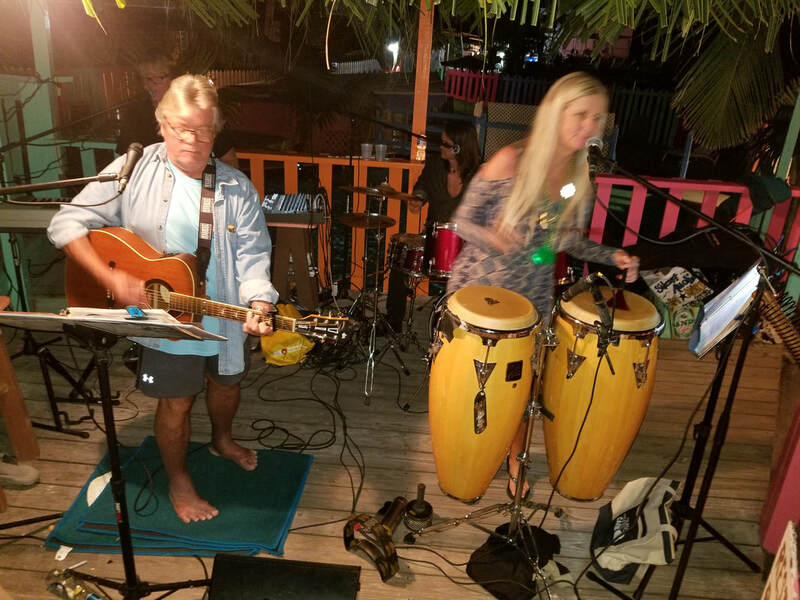 He made this video of the concert at Guana Cay to give people an idea of what it's like being at a Barefoot Man concert at Nippers beach bar in PARADISE! This next video was one I made of when we left Treasure Cay for Guana and our arrival for the Friday concert. When you go to the outer cays you can only get there by boat, and travel on land is by golf cart, there are no cars. The reason I mentioned this is because as you'll see when we get to Nippers, every cart on the island is there. ​all are one happy go lucky family. Great people and fun. When you watch the below video you'll see what I mean. The next two videos were of Guana Cay, the 1st (part 1) is during the day before the Saturday evening concert, and it shows a little of the sights of the island. The 2nd (part 2) shows what the Saturday evening Barefoot Man concert at Nippers beach bar was all about. The Saturday evening Barefoot Man concert at Nippers beach bar. The above videos were from our March 2017 trip to Abaco for the Barefoot Man concert at Guana Cay. Now this year Mrs. Tiki couldn't go, so I'll include some videos from my 2018 trip, where I went with friends but no wife. ​ The 1st video is me being forced to dance with all the other young girls, since my wife wasn't available to dance. This video is a MUST SEE as Tiki Tony shows his dancing skills! The St. Pats concert was Saturday evening. We did the below song at the Friday afternoon concert with about 1000 people out there; notice I didn't say we "performed" the song? Anyway we were BANNED from doing that song at the St. Pats concert; and George told us that Johnny, the owner of Nippers, told him if we were there doing that song at Saturday nights concert that he would fire George. This is a must see and a total embarrassment by my group of friends and me. The below video highlights are of March 2018 trip to Abaco for the Barefoot Man two day concert. Was there for only 4 days, but did all of this and more. In this video there is very little concert pics. The concerts were great of course, even getting on stage a few times with Barefoot to show off my vocals, but this video is more about how much Abaco has to offer. Can't wait for April, 2019.
purchase on I-Tunes, CD Baby & Apple Music. job. Mrs. Tiki makes a cameo appearance in the video also. throat. 24 hours later he was having surgery which showed he had stage two cancer. What a shock. We took him in for swollen glands. It turns out it's a good thing he went in and didn't ignore it. They started him on chemo treatments within the week. He had chemo every 2 weeks for the next 5 months. The captions in the party video explain the results of those treatments. Tony's Tropical Tiki Bar 2018 Promo Video below. We will bring the King Of The Caribbean to The Jersey Shore. Cayman Island and Bahamas legend himself The Barefoot Man. ​​This next Abaco video is a must see, starring yours truly, none other than Tiki Tony himself!! !